I've had a few questions about the bike we featured last week, so here's a few more detailed shots. The New Albion Privateer is my daily driver. This build is what we in the biz call a "mechanics special". Aka, the bike that I ride every day, but rarely service. The great thing about having a bike like this is any time I have a new prototype or sample part I just throw it on. That gives me an excellent base line for comparing iterations of products that aren't ready for mass production. For instance, this bike has seen every version of the Tanaka Decaleur. As a result it's slowly evolved into an almost flawless commuter bike. The tape is Soma Thick & Zesty in Camo Brown. It's a little funky, but it's growing on me. The Champs Elysees Low Trail forks were designed to fit a variety of frames, but paired with the Privateer's 72mm headtube it yields 45mm of mechanical trail. This works out nicely for larger handlebar bags that tend to hang over the front hub. The blades on these 65mm offset forks are a bit springier than the 45mm Classic Curves, but that certainly doesn't preclude you from loading it down a bit. I typically use 2 front panniers in addition to my Ostrich bag. While it adds a bit of extra, weight I love that I can slap on pretty much any rack I happen to get a hold of due to the selection of mounts. I have this prototype Gamoh Japan mini rack. It's similar to the Nitto M-18 and the Soma Champs Elysees, but it's made from sturdier CrMo tubing. I'm putting it through it's paces, but I doubt there's much that it can't handle, especially mounted directly to the mini rack eyelets. Looking forward to more new racks from Gamoh this year. I've been using this Ostrich rando bag for a couple years. I've tested a few other front bags, but this is the only one I bought outright. It's a modest, cotton bag with front closure. It has small rear pockets and a map case on top. This style of bag works great for commuting and photo shoots, because it comes off easily and can be carried with the shoulder strap. These new Sun XCD crankarms are one of the newer parts I'm trying out. They're similar to the classic Stronglight and TA style cranks, which utilize a direct mount large ring and a 3 bolt inner chainring. We've sold these crank arms for a while now, but the introduction of these new chainrings makes them far more compelling in my opinion. I'm currently using a 44t large ring and a 30t inner ring, but I may swap the inner ring for a lower climbing gear at some point. I have use a lot of derailleurs over the years, including road and mountain options from Sram and Shimano, but this Sunrace M40 is the cheapest derailleur I've ever used. It retails for about 20 bucks, and is equal parts aluminum and plastic. But you know what? It works great. Seriously. Paired with ENE Ciclo friction shifters it can push a 34t cassette with capacity to spare. After riding the Cazaderos and then the Gravel Kings for the last few months I decided to try out a set of the super light Soma Supple Vs. So far I've only had one flat in about 400 miles or so. These tires are noticeably faster than anything else I've ever ridden (340 g in 700x42c), but they're definitely a road oriented tire. Not that you can't use lightweight tires on dirt, but you need to be a little more conservative when you choose your line. I'm going to get my money's worth from these, but I'll probably try some of the upcoming skinwall Gravel King SKs when they show up. So that's my bike. Not a particularly fancy build, but it's a great ride for the money and the most reliable steed in my stable. I've always been a fan of Nitto Japan. Back when track bikes were still cool I always had a couple pairs of Nitto bars in rotation. There's just somthing about the feel of a steel bar that just doesn't compare to anything else. They feel solid, yet compliant. They don't transmit vibrations like aluminum, and won't snap and skewer you in a million places like carbon. Earlier this year when we were meeting with Akira-san (the boss at Nitto) in Taipei, I asked if they could make a mountain bike version of their famous Grand Randonneur touring drops. You may recall we like these bars so much we named our 650b touring frame after them. They have a classic French-style bend, with flared drops and slightly raised ramps. They work great for brevets and loaded touring, due to their multiple hand positions and conservative drop. I've ridden the alloy bars for years, but sometimes I get a little bit too rowdy and I wanted somthing that would hold up to "Manny Ride" scenarios. So the wizards at Nitto did their thing, and came back with a couple samples made from the same tubing as their unflappable track bars. I'm in love. They feel amazing. The hood position is perfect, the drops are comfy, and they look a treat. We're going to get a batch of these made up, but they're going to take a while to arrive. So if you're interested in a pair shoot us a line and we put your name on the list. That way if we know we're going to sell out we can get more in the queue so people don't have to wait 6 months if they miss the first run. Here it is, la parte segunda! The best part of waking up is cowboy coffee in yer cup, and a crackling fire to take the chill away. And waking up to this view made it easier to get out of bed, or z-rest as the case may be. We decided these were neo-americana conical tents. The company that makes them is based in Colorado and also makes yurts and tent cabins. Check them out if you want to get up in some nature. Our breakfast was Paleo compliant, although there was oatmeal to be had too. Manny's safety knife came in handy. This thing is for kids, but don't be fooled, that blade is sharp. We got to pet horsies and smell them too! These ones looked pretty bored, but I guess when you live on the beach it loses some of it's novelty. Ely was up and ready to go, putting his serious randonneur ethic into practice. The rest of us were about an hour late getting on the road, but what can I say, we run on MoM time. There must have been some kind of camper trailer meetup or somthing going on in Bodega Bay, because we kept getting passed by them riding out of town. Seems like the way to live don't it? Once we got on the 1 the traffic thinned out and we were able to get a little loose. Ely kept up a good pace, but always the gentleman, he didn't leave us in the dust. Sarah was all smiles as we made our way towards Tomales. We ran into more Randonneurs at Tomales Bakery, coming back to SF on the 600k. This bakery is definitely worth checking out. They were making croissant dough for the week. Roll, butter, fold, repeat. So yummy. We hit a good headwind as we rolled down Key's Creek at the mouth of Tomales Bay. That's when we remembered there are drops on under them there hoods. A sedge of cranes (or maybe a pod of pelicans?) was taking flight as we rode past. Once we rounded the bend and began riding towards Pt. Reyes Station the wind was at our backs and we were flying. There were more cars on the road as we got closer to town, but for the most part they were respectful. A big thanks to Norma and Calbike for making the 3 Foot Law a reality in California! Somebody should buy this old building and open a bike hostel. Just sayin. 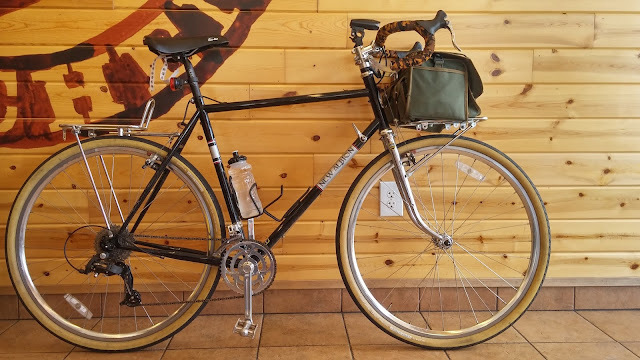 I broke my chain at one point, but thanks to my handy Soma Woodie I was back on the road before long. Sarah getting creative with the fruit presentation. Ely had a full schedule so he took off after lunch instead of riding out to Stinson beach with us. If you ever get a chance to ride with this guy you should jump at it. He's a riot and a damn fine bag seamster! By the time we got to the beach we were all pretty sweaty. We knew the climb up Mt. Tam would take all our energy so we didn't hang around long, but we couldn't resist taking one more group picture together while we still looked somewhat photogenic. We arrived back at the Presidio with sunlight to spare. We said goodbye to our friends from Best Coast Biking and Norma and I rode over to the famous Wave Organ to do a post ride safety check and sit by the bay to cool our heels for a while. The Organ wasn't playing much. Need to go back during a full moon for the full spectacle. On our way to the Oakland/Alameda Ferry from Fisherman's Wharf we found a great little Mexican spot for dinner. They let us park our bikes on the balcony so we could keep an eye on them while we enjoyed their excellent tequila concoctions. We're going to do more of these trips in the future, so keep an eye on the SomaFab Facebook page if you want to go with us. Space will be limited so we'll offer spots on a first come first served basis. See you next time campers!